Most homeowners select a belt drive garage door opener as they know that the belt drive system is the quietest opener system for their garage doors. It’s perfect for homes that have living areas above the garage. It also lifts and raises the garage door in a very smooth manner, there is no jumping from the door, swaying or large amounts of vibrations. Those are only two of the best features of the belt drive garage door openers, there are many other great features of this kind of garage door opener that you’re going to see in this article. This article has everything you need to know about buying the best belt drive garage door opener for the home. It’s comprehensive and extensive in the actual belt drive garage door openers we review. We feel it’s important to educate yourself before spending your money so we spend countless hours doing research so you don’t have to. But before going deeper, let’s look at our picks for the 4 best belt drive garage door openers that you should buy. Electric garage door openers were considered luxuries for decades after they first entered the market. Believe it or not, electric garage door openers have been around since the mid-1920s. While improvements have been made over the years to automatic garage door openers, the openers today function in a similar way as the original models – using an electric motor to lift and lower the garage door. When the garage door opener system is running, the electric motor does not provide most of the power to move a heavy garage door. Instead, most of the door’s weight is offset by the counterbalance springs attached to the door. Even manually operated garage doors have counterbalances, otherwise, they would be too heavy for a person to open or close them. The motor provides only a small amount of force to control how far the door opens and closes. An automatic garage door opening system comes in two types: shaft drive and trolley drive. The belt drive garage door opener belongs to the trolley drive. It uses a rubber belt running along a rail to pull a trolley. The trolley is connected to an arm that is attached to the top of the garage door. This arm slides back and forth to control the door movement. All of them are powered by an electric motor that receives a signal from the remote control or wall push button. The belt drive garage door opener remote is a radio transmitter. Modern belt drive garage door openers are radios that operate at 315 MHz (the 315 MHz frequency range avoids interference from the Land Mobile Radio System LMRS used by the U.S. military). The remote sends a signal to the opener itself, which has a radio receiver built in. When the opener hears a signal from the transmitter, it activates a relay that starts the motor running. The transmitter would transmit on a designated frequency, the receiver would listen for the radio signal, then open or close the garage, depending on the door position. Early belt drive garage door openers were very simple radio transmitters and receivers, which meant that one remote would open any garage door. If someone opened their garage door, they opened their neighbor’s garage door as well. When garage door openers started to become widespread, that presented a serious problem. The best belt drive garage door openers recently use the “rolling code” technology to transmit a radio signal from the remote to the garage door opener. The technology that helps modern garage door openers deal with the shared frequency problem completely. Rolling code is the same method of security used on the clickers of cars, and with some internet protocols for secure sites. Chamberlain, Liftmaster, and Genie are the leading companies in using rolling code technology for their belt drive garage door openers. Rolling code technology protects against intruders by generating a new security code every time the remote control is used on your garage door opener. When the remote control activates the garage door opener, a unique algorithm “rolls” the remote control’s code to one of more than 100 billion possible codes. The previously used code will be discarded, and the opener will know only to respond to the new code the next time the remote control is used. The same code will never be used more than once. Therefore, stolen previously used codes are useless to intruders. Some newest belt drive garage door opener models from Chamberlain and LiftMaster, such as the Chamberlain B550 Smartphone-Controlled ½ Belt Drive Garage Door Opener and the LiftMaster 8550W Garage Door Opener Elite Series, are equipped with Security+2.0. So what is that? Security+ 2.0 was released by LiftMaster in 2011 as a new version of remote control radio code. It operates reliably under all environments conditions and from a greater distance than ever before. Thanks to the latest multi-frequency technology the remote will operate even when there is interference from other wireless devices. It provides the highest level of security for the garage door openers. The best belt drive garage door opener should be equipped with Security+ 2.0. Most older cars will not communicate directly with the Security+ 2.0 radio, and will require a “Repeater Kit” to upgrade the in-car remote system to be compatible with this improved radio system. One repeater can control multiple cars, garage door openers, and gate openers. There are 2 main types of repeater kits that are available on the market: HomeLink Repeater Kit and Lear Car2U Repeater Kit. If all vehicles in the garage are HomeLink only one HomeLink repeater is needed. If all vehicles are Car2U, only one Car2U repeater is needed. Both repeaters are required if different vehicles sharing the same garage have systems made by both interior suppliers. HomeLink is available in many brands of vehicles, while Car2U is more commonly found in particular Fords and GM vehicles. When you are looking into purchasing the best belt drive garage door opener for the home, you will make a much better decision if you know the advantages and disadvantages of this kind of garage door opener. One of the biggest advantages of belt drive garage door openers is that it operates more quietly than other types of door openers. It is the quietest of the bunch and perfect for homes that have living areas above the garage. The Chamberlain MyQ-enabled Whisper Belt Drive Garage Door Opener, for example, is the quietest garage door opener we’ve ever seen. It’s virtually silent when in operation. Belt drive garage door openers are quiet because it uses a rubber belt instead of a chain to move the door. The rubber belt lifts the garage door in a very smooth manner. There is no jumping from the door, swaying, or large amounts of vibrations. Because the belt moves without any hesitations or binding, the door does not feel any of these effects while it is traveling. The belt itself is a steel reinforced rubber like what you would find in steel belted tires. This gives the belt tremendous strength and durability. While a belt drive garage door opener may provide quieter operating noises, it lacks in another department: STRENGTH. While the weight of a common steel or aluminum garage door is fine for any type of opener, a customized garage made of wood or additional insulation, for example, would require a chain drive or a screw drive. If a belt drive garage door opener is your choice, it makes sense to choose a unit that has a higher horsepower rating than normal. For example, if you’ve determined that your customized garage door needs a ½ HP chain drive garage door opener, you should look at the belt drive models that have a horsepower rating of ¾. Another disadvantage of this type of garage door opener is that it can be expensive. You will have to pay more for this kind than you would with a chain drive or a screw drive garage door opener. However, when you look at the benefits of a quieter, smooth, and durable operation, it may be worth the extra expense. Timer-to-close feature can automatically close the garage door after 1, 5, or 10 minutes. Motion detecting control panel allows easy programming of remote controls, keypads, and MyQ lighting accessories, and turns lights on automatically when movement is sensed. Quick-install rail system provides faster and easier installation. The Chamberlain WD962KEV Whisper Drive Garage Door Opener is the best belt drive garage door opener that you can buy. It’s one of the quietest and most popular garage door openers on the market. Backed by the world’s largest manufacturer of garage door openers, it’s reliable, built to last and fit almost any residential garage door. Equipped with the latest Chamberlain’s MyQ technology, this opener gives you the ability to open or close your garage door from anywhere you can get online with your phone. The MyQ app will give you a fair amount of control and insight into your garage door activity. It also allows you to set a custom rule for your garage door opener. For example, you can set a rule to create an alert if the door has been left open for 15 minutes or automatically close the door after a set amount of time. This belt drive garage door opener features a built-in battery backup so that, it will still work when the power goes out. The safety and security features will continue to operate as well, ensuring your family is protected in a power failure. This system provides up to 20 open/close cycles during the first 24 hours of an outage. 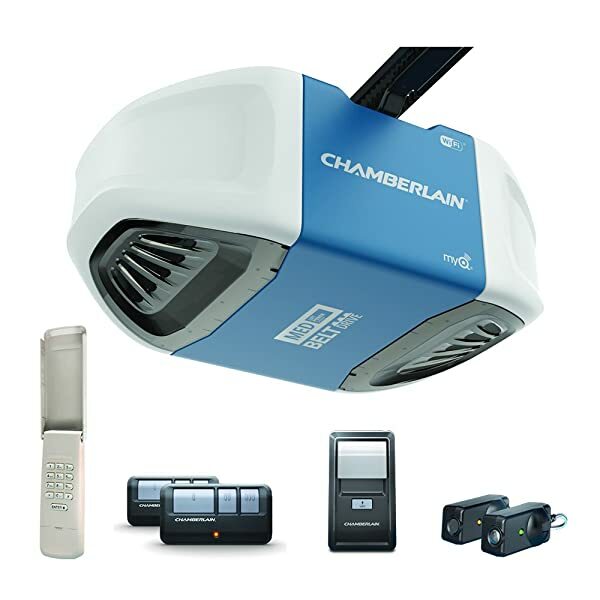 The Chamberlain B550 Belt Drive Garage Door Opener is the latest generation of opener technology from Chamberlain. It is extremely quiet and has improved to be more secure and more convenient than earlier generations. Chamberlain claims that this is the best belt drive garage door opener ever made. It’s fully compatible with your smartphones and almost any smart home system. This opener has an electric motor of ½ horsepowers which is ideal for steel or aluminum garage doors that are measured of 16 feet wide and 8 feet tall. But since it’s powered by the Chamberlain’s Lift Power System, it’s able to handle a heavier garage door, such as a wooden garage door, than a typical belt drive garage door opener does. We also love the fact that you can use the remote to open the door from 1,500 feet away thanks to the exclusive Tri-band technology. It’s very convenient since it allows you to get in the house very fast, especially in the winter when the outside weather is extremely cold. 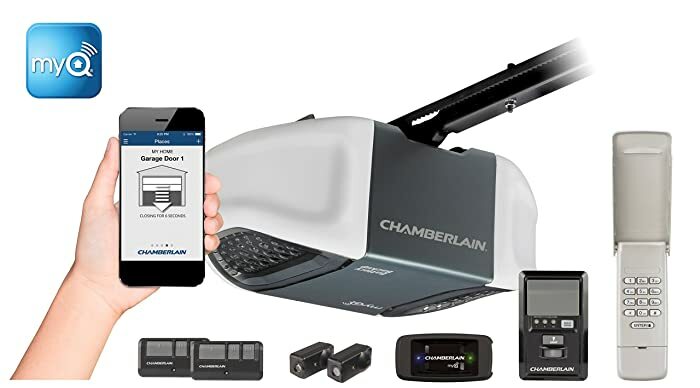 Like the Chamberlain WD962KEV, this belt drive garage door opener features built-in Wi-Fi and the Chamberlain MyQ App. You can get real-time alerts, open, close, and know the status of your garage door from anywhere. As this is the latest generation of Chamberlain garage door openers, it’s equipped with the highest level of encryption and monitoring that will protect your home from every hacker. If a ½ HP motor isn’t powerful enough to lift your garage door, consider the stronger version of this garage door opener – the Chamberlain B970 Belt Drive Garage Door Opener with a 1.25 HP motor. PosiLock locks down the door by electronically monitoring against a forced opening. 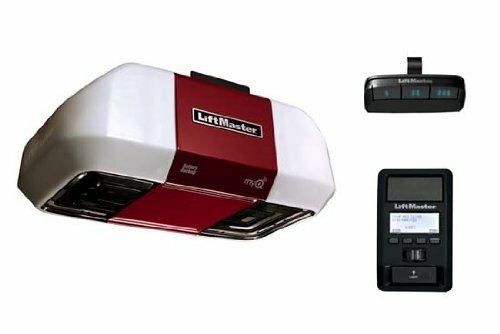 Before 2 models above came out, the LiftMaster 8550W Elite Series Garage Door Opener was the best belt drive garage door opener on the market. It has all the essential features and a few extras, like a timer-to-close function that will automatically close your door if you forget. The powerful ¾ horsepowers motor will lift doors of all sizes. The belt-drive system helps the motor run very smooth and extremely quiet. One of the best features of this garage door opener is the backup battery. This feature allows you to open your garage door up to 40 cycles within a 24-hour period if the power goes out at your home. The battery automatically recharges once the power is back on, so you don’t have to worry about running out of juice or manually recharging the backup battery. This garage door opener includes the standard safety features provided by the best garage door openers, including a safety infrared beam that projects across the base of the garage door and opens the door if anything crosses it. It is compatible with the MyQ home automation system, and it works with HomeLink if you have an automobile newer than 2012. However, the LiftMaster 8550W Elite Series has been available on the market since 2012, its built-in WiFi sensor isn’t really good. You’ll have to buy the 828LM LiftMaster Internet Gateway to boost the WiFi signal of the opener. This gateway communicates with the garage door opener or gate operator to open or close, or communicates to home lights to turn them on or off. Overall, this is still one of the best belt drive garage door openers available and is a great choice if you have a heavy door or just want an opener that you can’t hear through the whole house. The Genie QuietLift 800 ½ HP Belt Drive Garage Door Opener is an affordable garage door opener that is worth considering if you want to save some money. While it’s not the quietest belt drive garage door opener, it’s much more quietly than chain drive units and is a good choice if you are sensitive to noise or if you have a bedroom next to or above the garage. This opener is equipped with a 1/2-horsepower motor, which is strong enough to lift a sectional wood or metal door that weighs up to 400 pounds. Most 1/2 hp door openers only lift doors up to 350 pounds. comes with two 3-button remote controls and a three-button control panel that allows you to turn on the lights and lock the door from being used by the remotes. This function is helpful if you lose a remote or are going on vacation. Your garage door is the largest and one of the heaviest moving objects in your home. That means the features designed to enhance your door’s opening and closing are important considerations for your family’s safety. 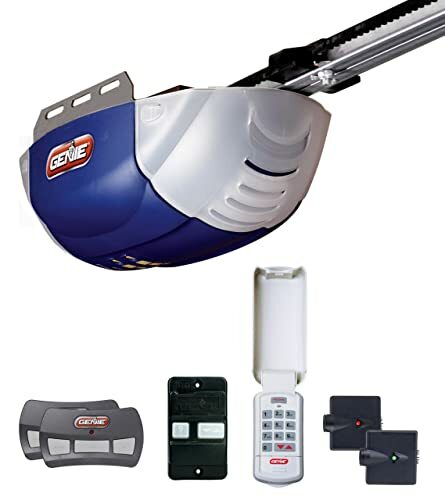 The Genie QuietLift 800 features the Genie Safe-T-Beam system – one of the best safety systems that have been made for a garage door opener. This system keeps people, pets, and vehicles safe by using an infrared beam that automatically reverses a garage door when an obstruction is detected in the door’s path. Its self-diagnostic feature can also help troubleshoot system errors.